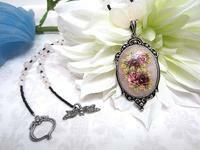 Art nouveau romance is alive and well in this handcrafted rose quartz pendant necklace. The pendant is a large rose quartz cabochon set in a scrolled antiqued silver plate mount. The cabochon is embellished with super-high-grade Tensha? rose decals in shades of red and pink. Red roses are the traditional symbol for love and romance, while pink roses symbolize grace and elegance. The 22" strand features matching rose quartz beads, spaced by matte black seed beads. The pendant necklace closes with an antiqued silver plate dragonfly motif toggle clasp. It?s another exotic pendant necklace from SPARKLE PLENTY. Fair as the flowers in the meadow, this refreshing seafoam green and rose pink bead necklace is a pure delight!